A while back I reviewed the reading machine that my mom, who suffers from macular degeneration, now depends on. I gave it a thumbs up, but also noted that she was having some problems. On my last visit I came up with a method that will help, if she can get the hang of it. The method is non-obvious, and isn’t documented anywhere I’ve been able to find, so I made a short movie to illustrate it. It almost doesn’t matter where, you just need a guide for carriage returns. Getting this right makes a huge difference. My mom was constantly fiddling with the position of the book on the tray. This frustrated her, and seriously impaired her ability to read fluidly. Align the bottom left corner of the book with the bottom left corner of the screen. Find the top of the page. 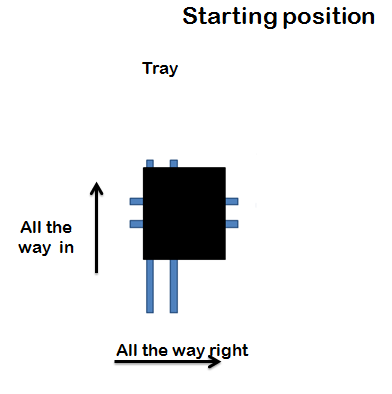 To do that you pull the tray out (forward, towards yourself) until the top margin of the page lines up with the top of the screen. 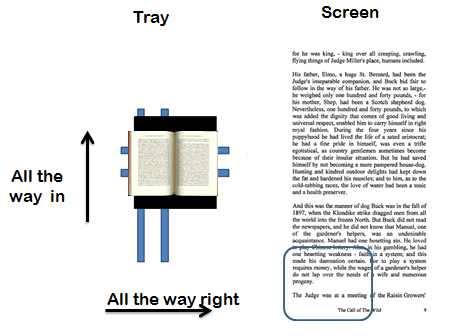 Read as many lines vertically as the screen can display. My mom had been advancing the tray (by pushing it in) once per line. This wastes effort and disrupts context. If the left margin screw is set, a carriage return always goes to the same place. So it was easy — at least for her — to make a visual connection from the end of the previous line to the beginning of the next one. I realize this part may not work for everyone, and maybe not even for her as her vision worsens. Right now, at her magnification, her screen can display 8 or 10 lines. At higher magnification, when only a few are visible, there will be less context to help make that connection. Then it may become necessary to scroll vertically once per line. But the longer that can be avoided, the better. Shouldn’t multi-thousand-dollar gizmos like this come with training materials that help people figure this stuff out? Yes, but I’ve given up being shocked that they don’t. If you’ve got a friend or relative in the same boat, let me know if this writeup — and/or the accompanying video — makes sense. 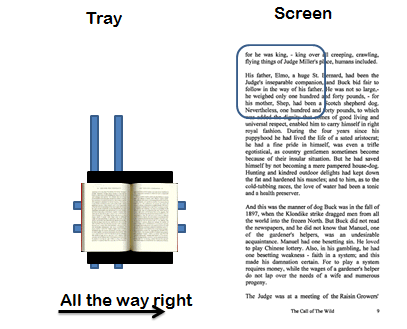 The video combines slides with a side-by-side animation of the tray and the screen. I wound up using PowerPoint, which conveniently handles the three ingredients: text, bitmap graphics, and vector graphics. Rather than use PowerPoint’s animation features, though, I made a sequence of frames, nudging objects by small increments from frame to frame. This turned out to be a surprisingly easy and approachable technique. Then I turned on a screen recorder — I used Camtasia, but it could have been any other — and stepped through the frames. Well, I never John. 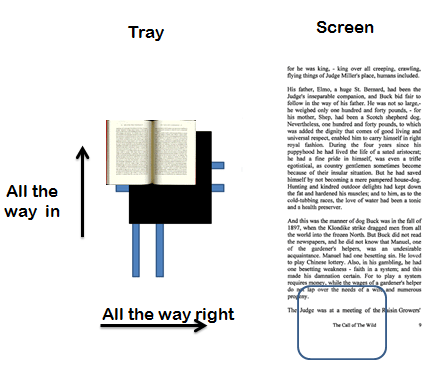 My father has Macular Degeneration too, and for the last 3 or 4 years I have been preparing very (very) large print texts for him to read using a tablet PC – he only needs to flick the inbuilt mouse key to “page”. It has severe drawbacks for someone who is not PC-Literate to start with … in navigating files … and of course each “page” ends up with the equivalent of about one line of original text, so you lose that “context”. Of course it only works for publications where I can get hold of an editable text file to start with, and it means I always have to be in the loop preparing texts. I am interested in your device and procedure for use. If you try it — or something similar — let me know how it goes. You may also be interested in the experiences of Susan Gerhart, who is a leading user and evaluator of a range of assistive technologies for people with low vision. My mom is a lifelong voracious reader, so workable adaptations are a very high priority for her. In addition to the reading machine, she has been making extensive use of audiobooks. On my last trip I visited the library and helped her check out an armful of audiobooks. Ironically, although these are heavily used by folks like my mom who suffer from low vision, the titles on the CD packages are printed in fonts and colors that she can’t read. It made me realize that the same technology we use to create singing greeting cards, which we just throw away, could be used to create talking CD packages that announce titles, authors, and blurbs. That is a brilliant idea about talking CD packages. I’m sure that someone could create a “stick-on” version that is recordable, so that libraries (or whoever) could do just that. These instructions are great, and would apply to a number of the video magnifiers out there. Thanks! By the way, is your mom receiving talking books through the Library of Congress/National Library Service for the Blind & Physically Handicapped program? Audio books (and players for the books!) are available on free loan to eligible readers nationwide. The new, and simply grand, digital talking book player features audible instructions the whole way through. Touch a button – and the player will tell you what it does. Also, many of the libraries participating in the NLS network loan large print materials as well — all mailed to a borrower’s home, at no charge to the borrower. She had been receiving free audiobooks by way of some program, though I’m not sure it’s the same one you cited. But she canceled it because she mostly didn’t want books they were sending, and I the mechanism for requesting items that she does want is ironically not accessible enough. I guess there’s a second-order problem here: people don’t just need help accessing the contents of books, they also need help accessing the catalogs and recommendation systems that lead to books. I will try that link John. My Dad’s problem is he is also a rather specialized reader – not popular things I can find in e-book or audio-book form. Old phsyical books or out of copyright Gutenberg texts.